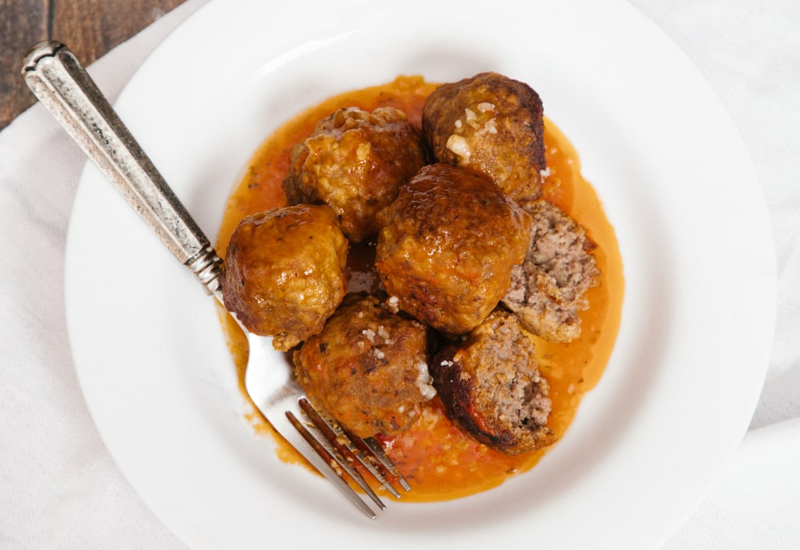 You can get classic Italian-style meatballs from your pressure cooker using this recipe. You will love how the pressure cooker helps the meatballs retain a moist texture, as well as the easy cleanup after dinner. The combination of grated Parmesan cheese and breadcrumbs adds incredible flavor and texture to the meatballs. Serve them over zoodles or spaghetti squash for a delicious weeknight dinner, or make them for weekday meatball lunch sandwiches. Mix ground beef, eggs, Parmesan cheese, bread crumbs, parsley, garlic powder, oregano, salt, and pepper together in a large bowl; shape into meatballs using 1½ tablespoons each. Heat oil in the pot of a pressure cooker set to Sauté. Brown meatballs in hot oil on all sides, about 2 to 3 minutes. Pour marinara sauce and water over the meatballs. Serve immediately with sauce from the pot on the side. Be sure to use freshly grated Parmesan cheese in these meatballs. You'll get much better texture and flavor that way! Use your favorite pasta sauce for simmering these. Marinara is a great base, but feel free to use vodka sauce or a tomato-basil sauce, too. The meatballs work well in multiple sauces! Per Serving: 490 calories; 28g fat; 18.6g carbohydrates; 39g protein; 161mg cholesterol; 1136mg sodium. I used vodka sauce (my favorite) with spiralized zucchini. Delicious! These meatballs were easy to make, my only issue is that I have to brown the meatballs in batches instead of all once, like I could do in a large skillet. Still, I think the quick cooking time makes up for it and they're good perfectly every time. Used the meatballs to make a sub sandwich and they were a big hit with the entire family. We just used hoagie style bread and cheese to make a complete meal. I used ground turkey instead of beef to make these meatballs. Such an easy alternative where I can reduce my red meat intake. These cooked nicely in the pot, and had great flavor too. Forgot to add the Parmesan when making the meatballs but they still turned out great. They were moist and very tasty with the jarred spicy marinara sauce I used. I served with either rice or on a hoagie bun topped with mozzarella. The whole family liked them (even those who don't normally eat meatballs). I look forward to using the Parmesan cheese next time. I followed the directions as described above, except I browned the meatballs in small batches. I seared/sautéed them on “normal” and added more olive oil, but as I turned them, several stuck to the bottom & broke apart. Once all meatballs were browned, I poured the sauce & water over them & followed remaining directions. But when I opened my Yedi, many of the meatballs had burned on the bottom. The meatballs were bland. I added more salt & pepper, but still blah. I used a tomato & basil sauce/marinara. I’m not sure what other spices I could have added to make them more flavorful.